Week four was a great week for MLS fans. It seemed like nearly every game ended with a stoppage time goal to rescue a draw or clinch a victory, and there were plenty of great goals and saves to go around. On a personal level, week four was less great: between a car breakdown, being super busy at my real job and the USA-Mexico friendly happening at 11 PM EST, I come to you for my weekly column a day late and a game short. Sincerest apologies to my loyal readers (both of you). 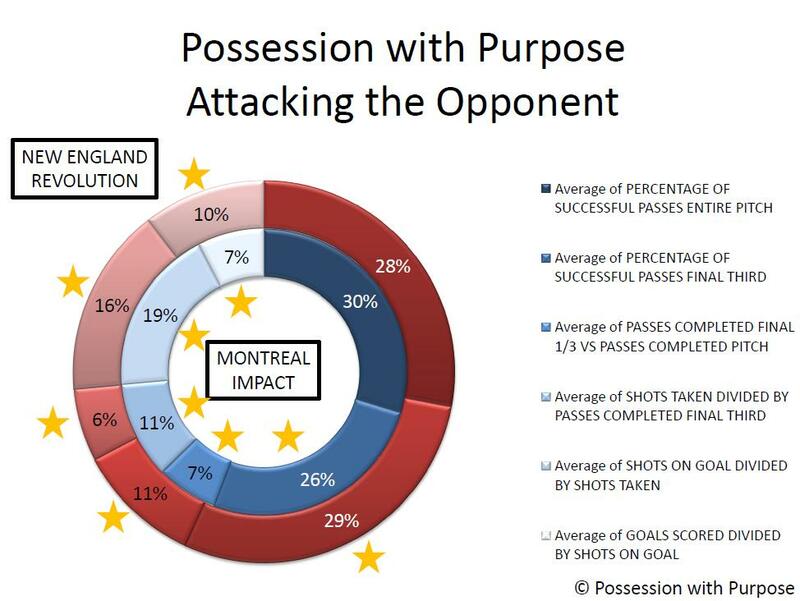 So this isn’t necessarily a stat, but watching Montreal is a clear lesson in direct attacking with long passes. The image above shows all the completed passes by Montreal in the middle third of the field, and you can tell that they tend to be pretty long. 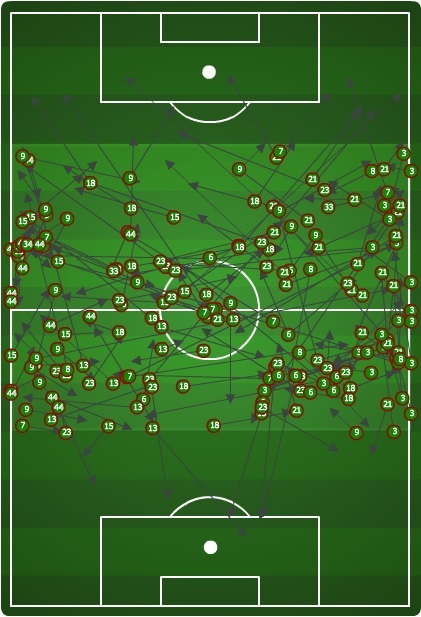 And these are only the completed passes – long passes have a higher tendency to be incomplete, so in fact Montreal attempted way more long passes than are in the picture. On the bright side, Montreal has some guys who are pretty darn good at those long passes (and another who’s pretty darn good on the end of them: check out this beauty that Mapp hits to Marco Di Vaio for the Impact’s lone goal. This isn’t new for Montreal: it’s exactly how they played last year when they rolled to a hot start and then struggled mightily down the stretch. The hot start hasn’t exactly happened this year; will the rest of the season play out any better? What hurts for Philadelphia fans is that if the centerback pairing of Okugo and Wheeler had managed to block a fourth shot, the Union probably would’ve snatched three points instead of just one. From watching Philly a couple times now this year, it seems like their backline, particularly Okugo, blocks a ton of shots. MLS fantasy stats say Okugo is averaging 9.5 CBIs (Clearances, Blocks & Interceptions) per game, and he tallied 9 against Montreal. But only two were blocked shots, and if he had closed Marco Di Vaio down just one step earlier on that goal…. Still, MDV is a class player even at his advanced age, and Okugo has saved enough goals this year that one slip up is hardly enough to pile on the guy. If you haven’t watched any Columbus Crew games yet this season, you’re missing out on the most entertaining team in the league. This tweet from Armchair Analyst Matt Doyle sums it up better than I ever could: the Crew is so fluid and so good at creating space in possession that they create a ton of chances. The straw that stirs the drink for all this is their talisman, Federico Higuain. 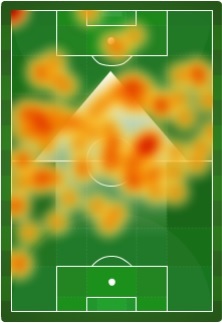 In the past, Higuain has floated all over the attacking half of the field to get on the ball, but this year he’s extended his meanderings to the entire field (see exhibit A: heat map above). Another part of what’s making Columbus so successful this year is how well the rest of the team plays off his movement. For example, when Higuain slides onto Bernardo Anor‘s flank, sometimes Anor or Dom Oduro or Tony Tchani makes a run off the movement to create an attacking chance. This kind of interplay is awesome to watch, and if Gregg Berhalter can keep his team’s creative spark alive then Columbus could not only make the postseason, but make some noise once there. After writing an opus to Columbus’ early play, it’s time to bring them back down to Earth a little bit. If it weren’t for the red card issued to Djimi Traore, the Crew’s perfect start would’ve been seriously in jeopardy. 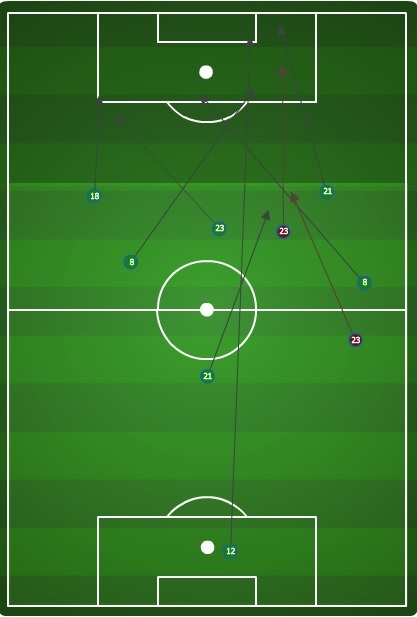 Sigi Schmid came out with a good tactical plan to counteract Berhalter’s attacking possession style, pressing high up the field and trying to win the ball off Columbus’ defenders. Before going a man down, the pressing led to a number of balls won in the attacking half which led directly to dangerous Seattle counterattacks. 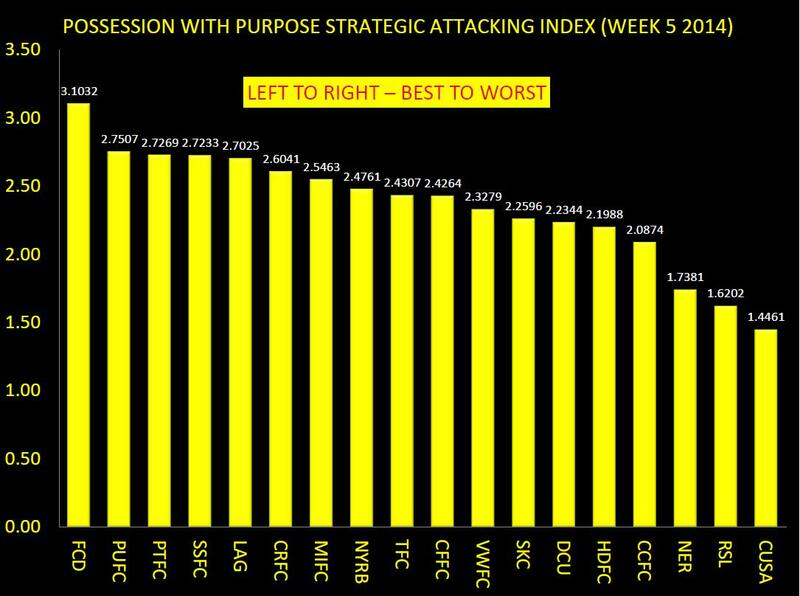 Some of this high pressing could also be attributed to the 4-3-3 that the Sounders employed in the absence of Clint Dempsey. I might be alone in this opinion, but I wouldn’t mind seeing Dempsey in that formation alongside Obafemi Martins and one of Lamar Neagle/Kenny Cooper. I know Sounders fans want Dempsey to be the focal point of this team, but he might just be more effective as a complimentary piece in a balanced formation. In the coming days, Matthias will be releasing our Expected Goals 2.0 statistics for 2014. You can find the 2013 version already uploaded here. I would imagine that basically everything I’ve been tweeting out from our @AnalysisEvolved twitter handle about expected goals up to this point will be certainly less cool, but he informs me it won’t be entirely obsolete. He’ll explain when he presents it, but the concept behind the new metrics are familiar, and there is a reason why I use xGF to describe how teams performed in their attempt to win a game. It’s important to understand that there is a difference between actual results and expected goals, as one yields the game points and the other indicates possible future performances. However, this post isn’t about expected goal differential anyway–it’s about expected goals for. Offense. This obviously omits what the team did defensively (and that’s why xGD is so ideal in quantifying a team performance), but I’m not all about the team right now. These posts are about clubs’ ability to create goals through the quality of their shots. It’s a different method of measurement than that of PWP, and really it’s a measuring something completely different. 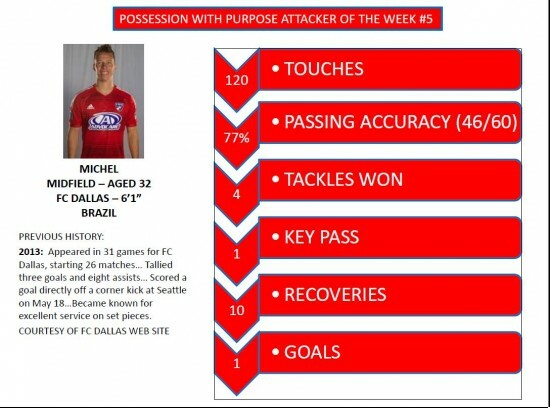 Take for instance the game which featured Columbus beating Philadelphia on a couple of goals from Bernardo Anor, who aside from those goals turned in a great game overall and was named Chris Gluck’s attacking player of the week. That said, know that the goals that Anor scored are not goals that can be consistently counted upon in the future. That’s not to diminish the quality or the fact that they happened. It took talent to make both happen. They’re events—a wide open header off a corner and a screamer from over 25 yards out—that I wouldn’t expect him to replicate week in and week out. Obviously Columbus got some shots and in good locations which they capitalized on, but looking at the xGF metric tells us that while they scored two goals and won the match, the average shot taker would have produced just a little more than one expected goal. Their opponents took a cumulative eleven shots inside the 18 yard box, which we consider to be a dangerous location. Those shots, plus the six from long range, add up to nearly two goals worth of xGF. What this can tell us is two pretty basic things 1) Columbus scored a lucky goal somewhere (maybe the 25 yard screamer?) and then 2) They allowed a lot of shots in inopportune locations and were probably lucky to come out with the full 3 points. Again, if you are a Columbus Crew fan and you think I’m criticizing your team’s play, I’m not doing that. I’m merely looking at how many shots they produced versus how many goals they scored and telling you what would probably happen the majority of the time with those specific rates. Now we’ve talked about this before, and one thing that xGF, or xGD for that matter, doesn’t take into account is Game States—when the shot was taken and what the score was. This is something that we want to adjust for in future versions, as that sort of thing has a huge impact on the team strategy and the value of each shot taken and allowed. Looking around at other instances of games like that of Columbus, Seattle scored an early goal in their match against Montreal, and as mentioned, it changed their tactics. 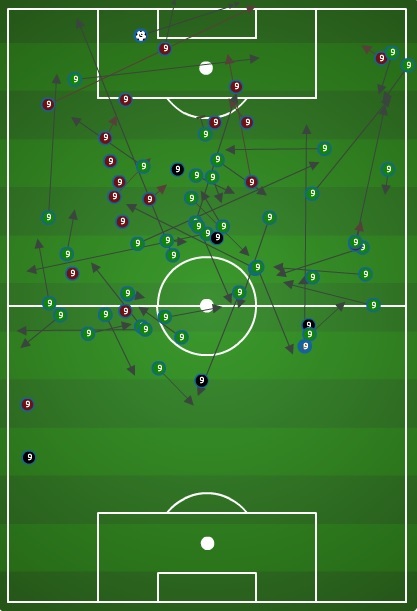 Yet despite that, and the fact that the Sounders only had 52 total touches in the attacking third, they were still able to average a shot per every 5.8 touches in the attacking third over the course of the match. It could imply a few different things. Such as it tells me that Seattle took advantage of their opportunities in taking shots and even with allowing of so many shots they turned those into opportunities for themselves. They probably weren’t as over matched it might seem just because the advantage that Montreal had in shots (26) and final third touches (114). 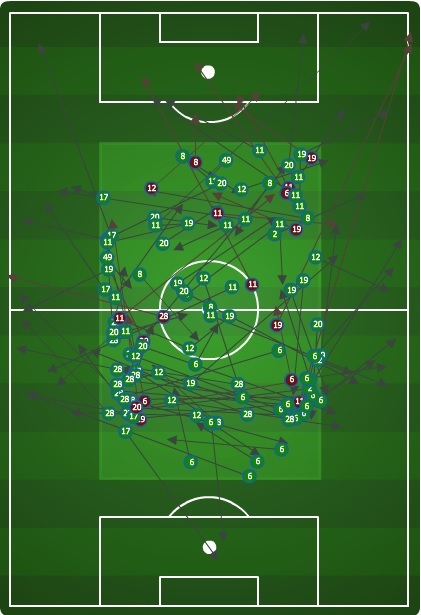 Going back to Columbus, it seems Philadelphia was similar to Montreal in the fact that both clubs had a good amount of touches, but it seems like the real difference in the matches is that Seattle responded with a good ratio of touches to shots (5.77), and Columbus did not (9.33). These numbers don’t contradict PWP. Columbus did a lot of things right, looked extremely good, and dare I say they make me look rather brilliant for picking them at the start of the season as a possible playoff contender. That said their shot numbers are underwhelming and if they want to score more goals they are going to need to grow a set and take some shots. There is a lot more to comment on than just Columbus/Philadelphia and Montreal/Seattle (Hi Portland and your 19 touches in the final third!). But these are the games that stood out to me as being analytically awkward when it comes to the numbers that we produce with xGF, and I thought they were good examples of how we’re trying to better quantify the the game. 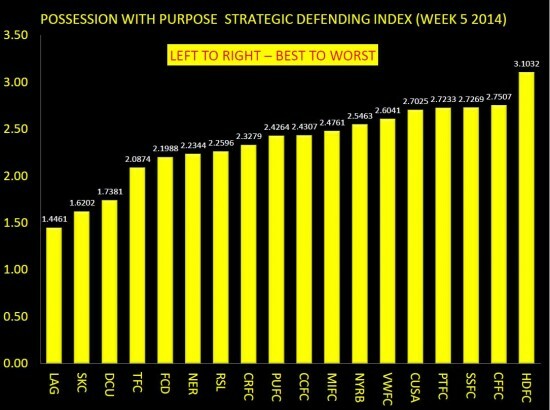 It’s not that we do it perfect—and the metric is far from perfect—instead it’s about trying to get better and move forward with this type of analysis, opposed to just using some dried up cliché to describe a defense, like “that defense is made of warriors with steel plated testicles” or some other garbage. Truth be told, last week was kind of a failure on my behalf. I trusted the data and information that was supplied by Golazo, and I’m not sure it really worked out as intended. A few mistakes have been pointed out to me, and while in general that could have been avoided by double checking the MLS chalkboard, I’m not sure that I really wanted to double check their work. This week I went straight to the Chalkboard for the data and then verified the total amount based off MLS soccer numbers. The result of the total numbers this week were a bit surprising. It’s weird the last couple of games (talking the CCL match against Toluca midweek); San Jose has done an incredible job at generating shots against talented opposition. First, against a very talented Deportivo Toluca that currently sits second in the Clausura 2014 table, the Quakes managed to put together 20 shots. Liga MX isn’t what they once were to MLS, but this is a very efficient showing. With that they barely squeaked by with a draw. This weekend was a much different story as they put the pedal to the floor and crashed through Real Salt Lake to draw a game they really had no business even being in to that point. Portland is another team that stood out, but for less good things than bad. As Chris already alluded to this morning (he stole my thunder! ), they’ve had an incredible amount of shots that have been blocked even before they get to the keeper. They’re obviously getting into advantageous locations and taking shots, but their opponents are getting out in front and deterring those attempts. 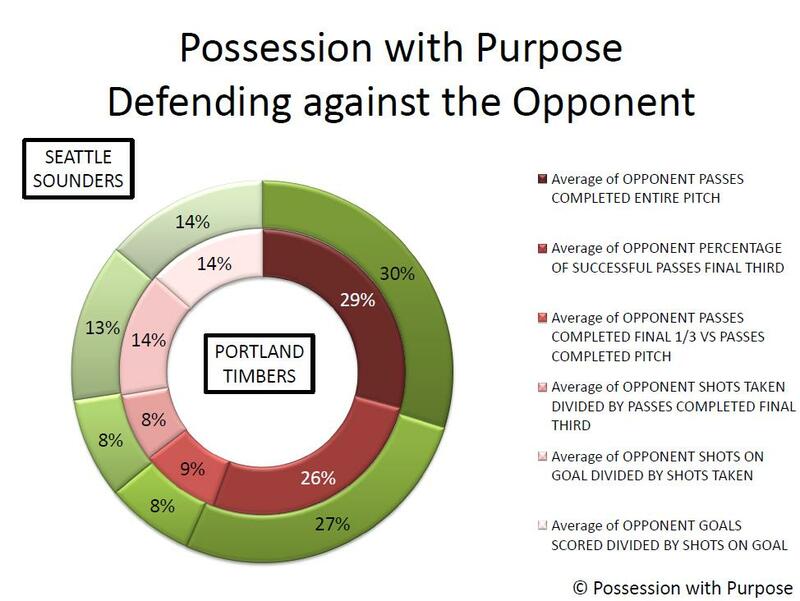 Which, if you were going to deploy a method for the stopping the Timbers’ offense, that would seem to be it. Stay in front of them and prevent as many shots from occurring as possible. Portland has shown itself to be a terribly direct team. As you saw last week, our metric predicted under the total amount of goals scored and this week we were actually over. Again this speaks to the strength of long-term averages, and you’re frequency going to be bouncing around the total amount. But the important thing is that we’re close, and that we understand where we came up short and where we went over. New England, Vancouver and FC Dallas are all clubs that were lucky to even make the “50%” cut off because they just barely projected for a goal. But that was because we round up to the nearest whole number. Lastly we have attacking third passing data. As you see, there were only two clubs over the “100” mark this week. Seattle and Philly both collected a large percentage of the total possession, which as we have talked about previously isn’t necessarily what’s important. It’s about WHERE you possess the ball. Well, for Philadelphia it worked out well as they pretty much dominated New England. Pushing the ball into the attacking third, the Zolos limited the total touches of New England in dangerous locations and created plenty of opportunities for themselves. However, Seattle is a different story. As shown in PWP, they dominated a lot of the raw numbers and even managed to finally produce a goal despite shot frustrations. But Toronto preyed on the counter attack and mental mistakes by Marco Pappa. They didn’t need many chances, but in the future we’ll have to see if they can continue to finish as efficiently as they did on Saturday. They sported the least amount of attacking touches in all of MLS with only 34 and while that obviously doesn’t correlate 100% to goals scored, the more opportunities you have the more likely you’re going to find the back of the net. I’m not usually interested in sports betting. I think most would find that surprising because we run an analytics site, and most analytics fit jointly, at least in Europe, with gambling. I avoid gambling for numerous reasons, but in general because I like the money I have and would hate to lose it. However, there is a bit of value in looking at the betting lines and understanding which teams are favorites and why. It can give us a bit of early insight into who people consider “the best” teams. In case you missed it, Las Vegas odd makers metaphorically walked to the front of the class room and posted the first pre-season grades, identifying who they believe to the best teams in MLS. Basically they painted big red targets on the back of the LA Galaxy and Sporting Kansas City going forward. Here is a little snap shot of the complete lines, courtesy of Steve Davis and NBCSports. Here are few things that pop out at me just looking at this list. First, the LA Galaxy are a club that we liked a lot going into the MLS Cup. We ranked them second in terms of the probability of winning the Supporters Shield and then third in the likelihood of winning the end of season tournament. Being cast aside by Real Salt Lake in the first round was not unimaginable, and yet it kind of took us all back for a moment. It’s not surprising to me that they probably hoist the imaginary pre-season trophy at this point. Second, Portland and Seattle are neck and neck in odds. If you thought the rivalry between these two I-5 teams culminated with the playoff match, you have another thing coming. This season is going to be rife with parity, and the difference between the 1st seed and the 5th could be substantially less than what it’s been in a number of years. This is only going to throw more wood on the fire for clubs like Seattle and Portland, creating an even more tension filled stadium. Oh, hey Vancouver, you’re there also… your just not “there” yet. 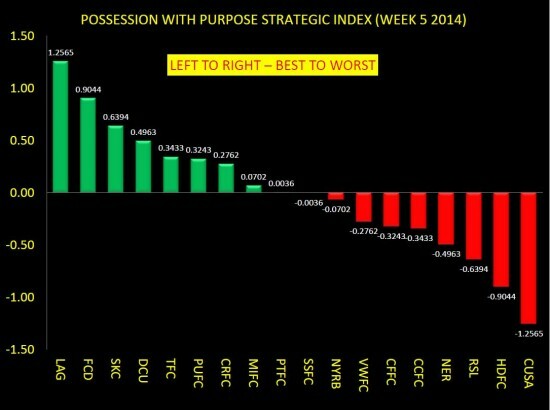 Third, Toronto goes from being on the worst teams in the league to big signings and having the 8th best odds to come home with silverware at the end of the season. The tides look on the brink of turning in the Queen City and could yield a very fun summer for the Reds. Some thing well deserved for their fans with the incredible support shown through some disappointing years, and really since their arrival to MLS in 2008. Lastly, who could blame you if really you wanted to throw five dollars down on DC United. Eddie Johnson/Fabian Espindola, a rebuilt back line, and young potential US internationals in Perry Kitchen and Bill Hamid. 50-1 odds? Heck, I may just throw 20 dollars on them and become a season long United fan.